iPads, Macs, iPhone 6S and... iPods? WWDC 2015 is underway! We culled all the big news from the Day 1's 2+ hour keynote below and will continue updating this page as our conference coverage continues. Curious how iOS 8 matches up to iOS 9? We pit the two in a no-holds-barred versus, plus reveal the 12 great iOS 9 features Apple didn't mention on the keynote stage. For more fighting fun, check out Apple Music vs Spotify ... and everyone else. And for some eye candy, check out OS X 10 El Capitan in pictures. Want to make the switch from Android to iOS? Apple made just the thing to help you do so. There are some hints in iOS 9 as to what the iPad Pro will bring, too, and a some heavy hints from the new mobile OS as to what we'll see in the iPhone 6S. 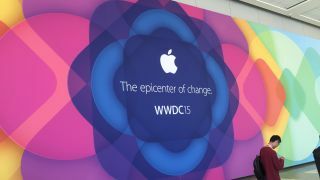 If you're pressed for time, we have a quick and dirty rundown of the keynote's events, too. Apple's Craig Federighi broke down iOS 9 on the keynote stage, revealing Siri is getting smarter and more proactive in the new update. The personal assistant will know when you get in the car, automatically put new appointments in your Calendar and, by looking through your emails and contacts, give a guess as to who that random number calling you might be. An improved QuickType keyboard is coming to the iPad, making typing and editing much faster and easier than before. Also for the iPad, new Multitasking improvements include Split View and picture-in-picture viewing. Slide Over lets users open a second app without leaving the app they're currently using. Split View will only be available on the iPad Air 2, while the other views will be available on Apple's family of iPads. iOS 9 takes less space to install than iOS 8, Apple claimed, so the company expects many upgrades. Apple claims that with average use, the iPhone 6 battery should last another hour. The beta will be available to developers starting today with a first-ever public beta coming in July. It will be a free upgrade for all in the fall, and is coming to all the devices that worked with iOS 8. Get the full iOS 9 rundown right here! Apple is replacing a few of its tried and true apps with better ones in its new mobile OS. News is essentially a Newsstand replacement that replicates some of Flipboard, Blinkfeed and Feedly's best elements, curating articles for users based on their interests. Publishers like the New York Times and Conde Nast will make their content available on News. It'll be available for iPhone and iPad. News is only headed to the US, UK and Australia, at least to start. There's also a new Notes app, which has several Evernote undertones. Users can add checklists of to-do items and access their cameras to add photos or scribble notes with their fingers. Also in iOS 9, Passbook will be renamed Wallet. Apple announced what we all suspected to see: Apple Music. As he introduced it, Cook said of Apple Music: "It's going to change the way you experience music." There are a few elements to the new service. First, there's a 24/7 live global radio station called Beats 1. It's hosted by some big radio names from around the world and will feature interviews, guest hosts, news and music culture bits. Then there's Connect, which lets artists, whether on a major record label or unsigned, connect with fans through their music, pictures, lyrics and mix taps. Music videos are watchable on Apple Music, too. A feature called For You provides recommendations from actual human curators. Tell Apple Music what you like, and you'll get picks based on your choices. Users will still have access to their iTunes library, and iTunes songs are available on demand for streaming and saving for offline listening later on. Users can share playlists, albums and videos with their friends and contacts. Siri can pull up songs you ask it to find using colloquial terms, like, "Play the top song from January 1982" or "Play the song from the movie Selma." Apple Music will cost $9.99 a month, and comes with a family plan for $14.99/month for up to six family members. Apple is offering a free three-month trial. Apple Music arrives with iOS 8.4 on the iPhone, iPad and iPod touch on June 30. It will be available for Android and Windows "later this fall." Apple CEO Tim Cook began the keynote by teasing we'd learn about updates coming to the watchOS, and we sure did. Cook specifically revealed native apps are coming to the Apple Watch via an update to the software. watchOS 2 is bringing new faces, features and functions. Developers will be able to create their own complications - watch lingo for the various things you see on your a watch face - so users can populate their Apple Watch face with third-party apps. Users will be able to pick a photo from the Photos app to use as their watch background. Another watch face, called Time-Lapse, brings images of iconic locales from around the world over 24 hours. Apple also announced Time Travel, and while it won't transport you into the future, turning the Digital Crown will show you upcoming events and temperatures. When the Apple Watch is turned on its side and is charging with the watchOS update, it automatically switches to Nightstand mode, and the Digital Crown turns into a snooze button while the side button turns off alarms. Users can email directly from their wrist with smart replies, emojis and dictation. On the health and fitness front, third-party apps can contribute to the Watch's Activity rings and Siri can start and end workouts. Users can share their Activity and Workout achievements on Facebook, Twitter and through Messages. All of Apple Pay and Apple Map's new features (see below) are headed to the Apple Watch. Uses can also use HomeKit to control lights and other things in their homes. The Apple Watch OS 2 update is coming to all in the fall, with the developer preview available today. We learned the latest version of OS X is called OS 10 El Capitan. Improvements to Spotlight and built-in apps are part of the update, and performance is getting a nice boost. One of the neatest little improvements is the ability to mute the random sounds that often (most of the time) start playing when you open a Safari tab, a feature already available in Chrome. Spotlight is getting more intuitive, letting users "search in their own words." Apple's Metal graphics engine is bringing performance enhancements to the Mac, which is especially good for games. Developers will get their hands on the new OS X today, with public beta starting in July. It will be available to the public fully this fall as a free update. As for Apple's mobile payment system, as you may expect, the service is expanding to more stores like Trader Joe's and JC Penney in the US. The biggest news of all though is that Apple Pay is also arriving in the UK next month. The service is coming to a number of major banks and retailers, but perhaps most excitedly, users will be able to pay for their rides on public transportation. This should make public transport riders very happy: Apple Maps is finally adding transit info. Transit directions are headed to major cities like San Francisco, New York and London as well as numerous cities in China. Nearby restaurants, bars, shops and activities will also pop up on Maps.